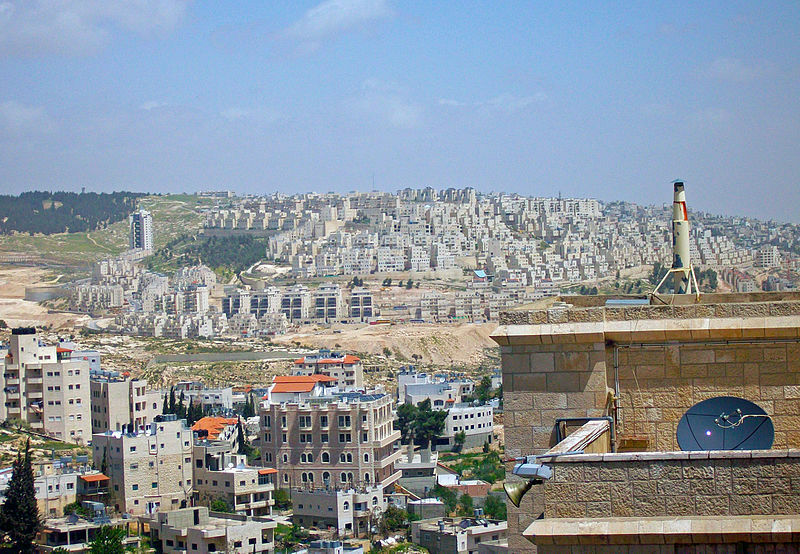 On Election Day in Israel, the sky is hazy over Har Homa, a Jewish settlement in East Jerusalem. A terraced neighborhood of white apartment buildings, Har Homa’s existence is a point of pride for Israeli Prime Minister Benjamin Netanyahu. He visited here on the eve of the last election in 2015 to boast of authorizing its construction in the 1990s in the face of US censure. The settlement, he bragged, has effectively cut off Bethlehem from Jerusalem. Four years later, Netanyahu is promising to annex settlements in the West Bank should he win, with no discernable pushback from the Trump administration. In Har Homa, Netanyahu’s fans are easy to spot. At the entrance to the neighborhood, a car speeds by a green topiary in the shape of a horse. The vehicle has Likud posters and a thumping boombox lashed to the hood. As it slows down next to Har Homa’s polling site, an elementary school with a fence painted in primary colors, the driver and his front seat passenger smile broadly. “Mahal! Mahal! Mahal!” they shout—the word is the Hebrew acronym for “the national camp,” which appears on Likud’s ballot slips. Inside the school, Roni and Maor, two poll workers, are sitting at a table offering instructions to the few voters trickling inside to cast their votes. Roni, 20, has long black hair and wears a baggy black hoodie over black stretch pants with white sneakers. Maor, also 20, is in a white t-shirt and a necklace with a gold feather pendant. On the table are a bag of half-eaten sunflower seeds and a pack of Uno cards. Both are first-time voters. They aren’t supposed to talk about politics because they are soldiers in the Israeli army. Roni is in the homefront command and Maor is a combat soldier. They agree to speak using only their first names. And what they reveal is nothing short of adoration for the man who has been prime minister since they were both 10 years old. “I voted for Benjamin Netanyahu,” says Roni. “I think the change he has done for the past decade is the best change we have had since 1948,” when the Israeli state was established. As Netanyahu superfans, Roni and Maor represent a trend in their age group this election. A poll from the Israeli Democracy Institute last week showed that among Israelis between the ages of 18 and 24, Netanyahu outpaces his rival Benny Gantz by an almost 50-point margin of 65% to 17%. Israelis older than 65, by contrast, prefer Gantz by 53% to 35%. The figures paint a clear but unsurprising picture: Israel’s right wing is partly powered by the youth. In 2005, young people were on the front lines of the fight to retain the settlements in the Gaza Strip, a bid that ultimately failed when then-Prime Minister Ariel Sharon ordered them evacuated. On Election Day, many young people are heeding Netanyahu’s call for a “strong right,” which he contends is only guaranteed by a vote for Likud. But it’s unclear that the youthful energy will be enough to keep Netanyahu in power. As the polls close at 10pm Israel time, one exit poll shows Netanyahu and Gantz tied for mandates; two others show Gantz leading Netanyahu. Now both Gantz and Netanyahu are claiming victory. Later, Roni and Maor are joined at the table by a third poll worker, 19-year-old Avi from the Jerusalem neighborhood of Armon Hanatziv. Another soldier, he also is unable to give his last name. Avi agrees with Roni: the corruption charges didn’t sway his vote away from Netanyahu. With the polls now closed, Israel and the world still don’t know if that change has been achieved—or whether, with the help of first-time voters like Roni and Maor, Netanyahu’s rule will continue. Whatever the results, considering the youth, Israel’s future most likely still belongs to the right. Naomi Zeveloff is a reporter based in Israel and the Palestinian territories, and is the Forward’s former Middle East correspondent.